Scottish Water has submitted its first drought order application in five years following a prolonged dry spell across parts of the country. The application for Dumfries and Galloway came after recent rain resulted in only a "very small improvement" in stocks at the Black Esk and Penwhirn reservoirs. The order allows water to be taken from other sources to supplement supplies. Scottish Water said burst pipes would be repaired "quickly and efficiently". The company said figures released by the Met Office showed that in 2010, Scotland had experienced the driest January to June period since 1941. It said there had only been four other drier years since records began in 1910. Scottish Water spokesman Peter Farrer said: "We have been taking prudent steps to plan a range of actions should the lack of rainfall continue. "We consulted with Sepa, the Fisheries Board and Scottish Natural Heritage before the formal application for a drought order was made and we are in constant dialogue with them. "Scottish Water is also continuing to carefully monitor and manage reservoir levels and look at alternative sources of water." The publicly-owned company said that a recent burst of rain had not resolved the issue as a sustained period of heavy rainfall was required to start replenishing the reservoirs. 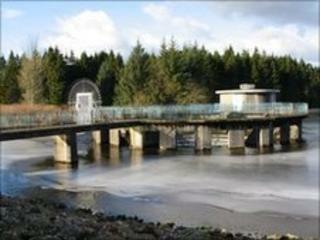 Its application for the drought order has to get the approval of the Scottish government. Mr Farrer added: "Our priority is always to ensure customers continue to get fresh, clean drinking water at all times. "We will not be imposing a hosepipe ban as part of these measures but we are appealing to customers to conserve supplies where possible and use a watering can or bucket for their gardens and washing the car. "Even better is collecting rainwater in butts which can then be used to water plants in the garden - plants prefer natural rainwater." He said small changes like showering instead of taking a bath, turning the tap off while brushing teeth or using a full load instead of a half load in washing machines could make a difference. About 22,000 Save-a-Flush units have also been delivered to properties across the affected areas.